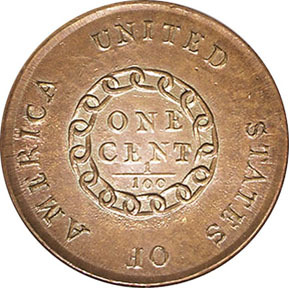 The first Large Cent appeared in 1793. 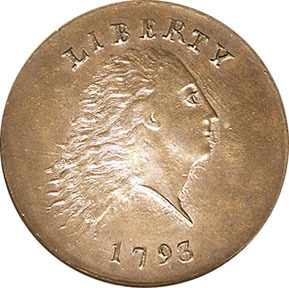 The front of the coin featured a head of Miss Liberty, her hair flowing behind her head in free, unfettered locks. The word "LIBERTY" appears above her head; the date "1793" below. The reverse consisted of a continuous chain of 15 links, representing the 15 American States in existence at that time. The denomination, shown by the words "ONE CENT" and by the numerical fraction "1/100", appear within the chain. The words "UNITED STATES OF AMERICA" surround the chain. Instead of responding with enthusiasm over the striking of the first truly American coin, contemporary newspapers poked fun at the new designs. This design was short-lived and was replaced late in the year by the 1793 "Wreath" Cent.